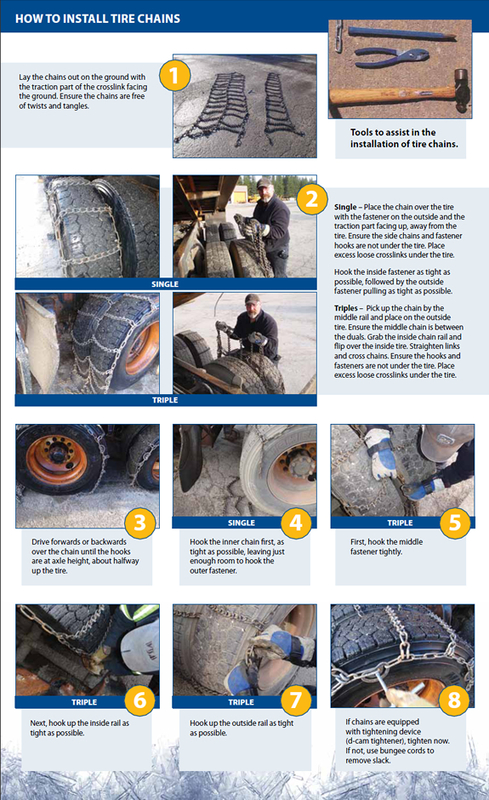 Last year, the Commercial Vehicle Safety Enforcement (CVSE) team shared a blog and video on the eight steps to installing winter tire chains to your vehicle. The video is one of our most popular with approximately 60,000 views by you. Thanks for that. We thought it would be a good idea to revisit the topic but this time focusing on commercial vehicles. Hopefully you find this one as useful as the first video. If you’re not so much into the moving pictures, here are a couple of infographics that you may find useful. There is a HUGE DIFFERENCE in tire chains nowadays. I have 6 sets of the heavy TRYGG chains and a single. Mind you, it’s not easy to put them on at age 55, but once they are on you are good to go anywhere. I see these cheap Chinese chains, light, easy to put on, but if you wipe your feet once, you might as well burn yourself a hole so you don’t slide backwards, because you likely ain’t going forwards. Do automatic spinning chains still qualify? Automatic spinning chains are still allowable on vehicles less than 11,794 kg. Commercial vehicles with a LGVW of 11,794 kg or greater must use steel link chains. 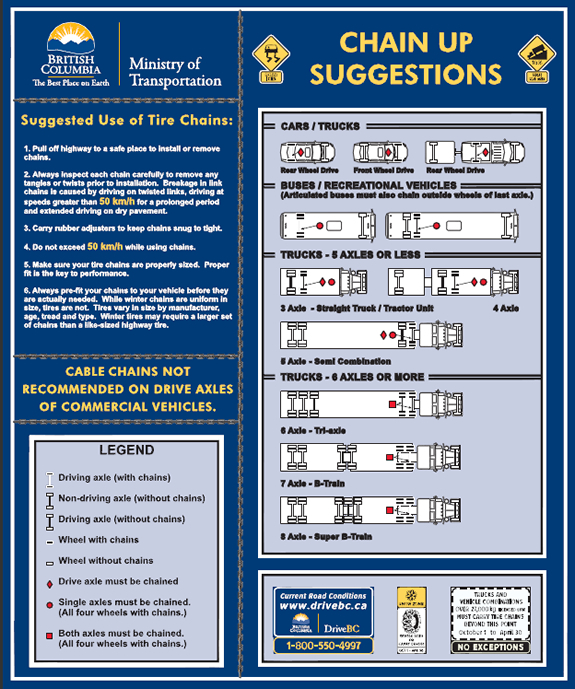 Yes, automatic tire chains are acceptable and do not need to be used in conjunction with wheel chains. (b) in the case of any other motor vehicle, any device designed by a manufacturer to increase the friction between a tire and a road surface covered with ice or snow.